You are here: Coaching Leaders > What is Appreciative Inquiry? AI is a participative learning process to identify and spread best practice. It is also a way of managing and working that encourages trust, reduces defensiveness and suspicion, and helps to establish strong working relationships quickly. AI was developed by David Cooperrider and his associates at Case Western Reserve University in the mid-eighties. His wife Nancy, an artist, educated him about the “appreciative eye” – an idea that assumes that in every piece of art there is beauty. AI applies this principle to business. The key feature of this approach is that it uses existing strengths, achievements and successes – the aspects of people’s work that they are proud of, that motivate them, and that are getting good results – as a foundation for a credible vision of the future, and a launching pad to reach that future vision. It does not ignore past failures, but helps people to collectively get into a more positive and therefore more creative frame of mind to come up with ideas for improvement. The very act of asking a question influences the state of mind of the person who is asked. Because teams, organisations and societies move toward what they persistently ask questions about, an Appreciative Inquiry is the investigation of those things that are most effective within an organisation or any other sort of human system. 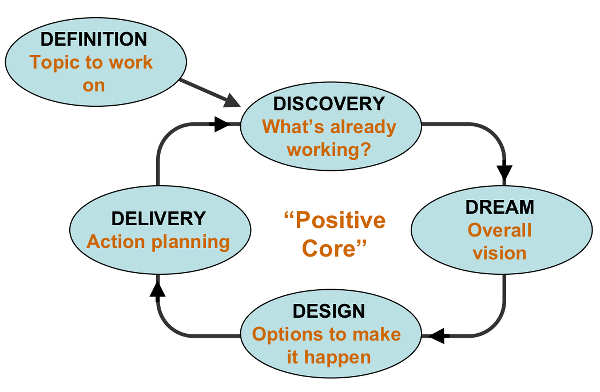 Once we have identified this “positive core” and linked it directly to a strategic agenda, changes not previously thought possible can be rapidly achieved while at the same time building enthusiasm, confidence and energy to get things done. Plan for how the process will drive change. What do you value about… yourself, work, organisation. What do you think is the core life-giving factor or value of your organisation –which it wouldn’t be the same without? If you had three wishes for your organisation, what would they be? What achievements are you (and/or your team) proud of? Apart from the money, what makes it worth coming into work? Instead, people get into a positive, energised state because you’re focusing on what’s good about their work. It invites people to engage in building the kinds of organisations and communities that they want to live in. It means you won’t be throwing out the good stuff that’s already there when you start to build your new organisation. In every human system, something works. Reality is created in the moment and there are multiple realities. It is important to value differences. We anticipate the customer’s needs and we are continually learning about what they want. My coaching practice is full and growing through word-of mouth recommendation. Provocative propositions resemble answers to the ‘miracle question’ in Solution-Focused Therapy – except that they are explicitly grounded in past successes, rather than being dreamed up from scratch. Because memory is state-dependent, people may need some time to get into a positive frame of mind to recall their best experiences. Bear in mind “ecology” (knock-on effects and unintended consequences on the wider system) when choosing the topic – go for optimising the system rather than maximising a single variable. When people focus on what’s working, they feel more positive. Positive emotions increase energy, creativity and resilience. Download our free ‘What is Appreciative Inquiry?’ briefing paper. For more about Appreciative Inquiry, some videos of AI sessions in action, and practical tips, see the Appreciative Inquiry postings on this site, or visit the Appreciative Inquiry Commons. The central resource for AI is the Appreciative Inquiry Commons. A Positive Revolution In Change: Appreciative Inquiry is a great introduction. For Appreciative Inquiry facilitation and coaching, call Andy Smith on 07967 591 313.